Heroes are not judged merely by their size, but by the size of their hearts. Following more than a million votes by the American public and the opinions of an expert panel of celebrity animal lovers and dog experts, a tiny Chihuahua named Harley from Berthoud, Colorado has been named this year’s most courageous canine and biggest dog star. 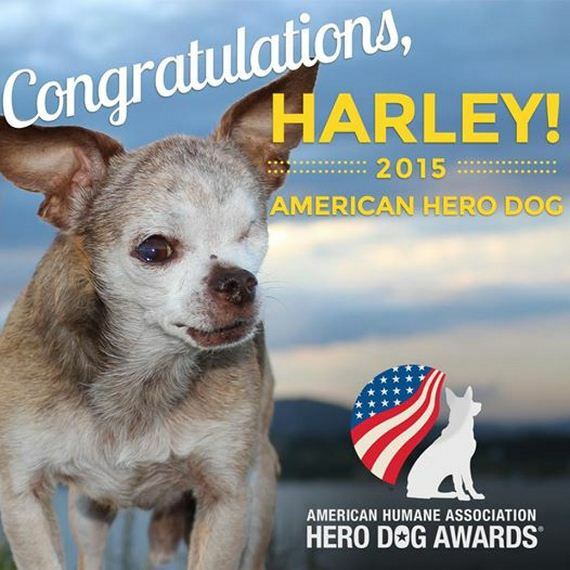 Harley beat out 170 other heroic hounds and to capture the top title of “American Hero Dog” at the 2015 American Humane Association Hero Dog Awards, presented by the Lois Pope LIFE Foundation, Inc. and broadcast nationally on Hallmark Channel October 30 at8 pm ET/PT, 7 pm Central Time. To read about the other winners, click here. 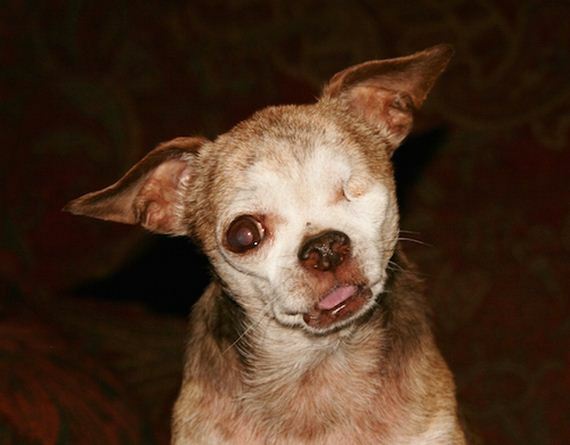 Harley spent 10 years living in a small cage in a puppy mill before he was rescued and found a loving home. 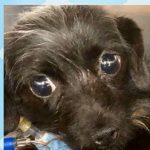 His journey of physical and emotional healing inspired a campaign called “Harley to the Rescue,” which has raised the funds to save and provide medical care for more than 500 dogs from puppy mills over the past two years. 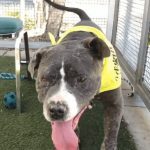 Harley personally goes on rescue missions, and there is no doubt Harley is keenly aware of what is happening. There is something indescribable in the way he communicates with the sad and scared dogs. As a spokes-dog against puppy mills, Harley has educated thousands of people of all ages about the horrors of the commercial dog breeding industry. Harley also makes public appearances at events and schools where he gladly accepts love and attention from everyone. 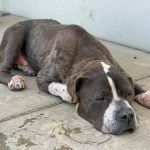 Harley’s battered appearance is a testament to the neglect and rough treatment he experienced, leading to a diseased heart, a mouth filled with rot, a fused spine, a broken tail, gnarled toes, and legs that were deformed. And then there is his missing eye – the result of his cage being power-washed with him in it (an all-too-common practice in puppy mills). 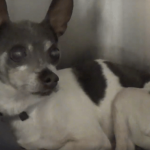 All of these conditions were the result of years of horrendous neglect and abuse. To change this reality, Harley is a voice for the countless breeding dogs still living in puppy mills around the country. 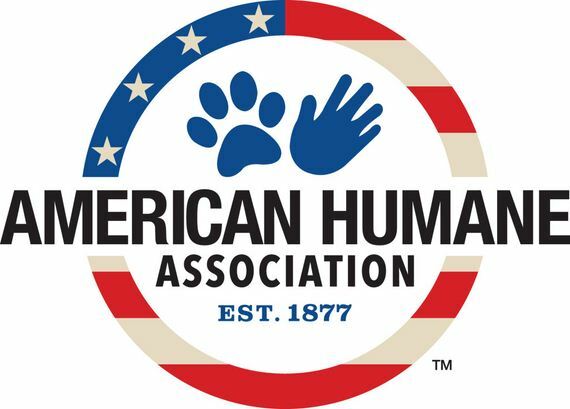 As a result of his work, Harley won the American Humane Association Hero Dog Awards’ Emerging Hero Dogs category, for “ordinary” dogs who do extraordinary things. This year, the Emerging Hero Dog category is sponsored by Merial, maker of NexGard® (afoxalaner) Chewables. Thank you to them for helping draw attention to Harley and further his vital mission. The sold-out, star-studded awards honoring America’s most courageous canines were hosted at the Beverly Hilton Hotel last night by television and film star James Denton and model and animal advocate Beth Stern, accompanied by a galaxy of celebrity stars and presenters including Michelle Beadle, Bruce Boxleitner, Lacey Chabert, Cristina Ferrare, Derek Hough, Bindi Irwin, Kym Johnson, Bailee Madison, Cameron Mathison, Brandon McMillan, Pauley Perrette, Charlotte Ross, Mark Steines, Jade Roper, Alison Sweeney, Lea Thompson, Tanner Tolbert, Fred Willard who did a hilarious segment with Hallmark mascot and Hero Dog Awards spokes-dog Happy the Dog, and more. Kevin Nealon of Saturday Night Live and Eric Stonestreet from Modern Family provided delightful video skits. John Ondrasik’s Five for Fighting provided the lead musical performances, which brought down the house. Before the show, the audience was treated to the artistry of The Alex Donner Band and the singers Will and Anthony Nunziata. The event will be broadcast nationwide by Hallmark Channel on October 30 at 8 pm ET/PT, 7 pm Central. 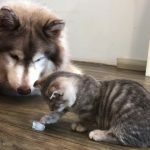 The program will air as part of Hallmark Channel’s Pet Project, the network’s cross-platform advocacy campaign designed to celebrate the joy and enrichment animals bring to our lives. 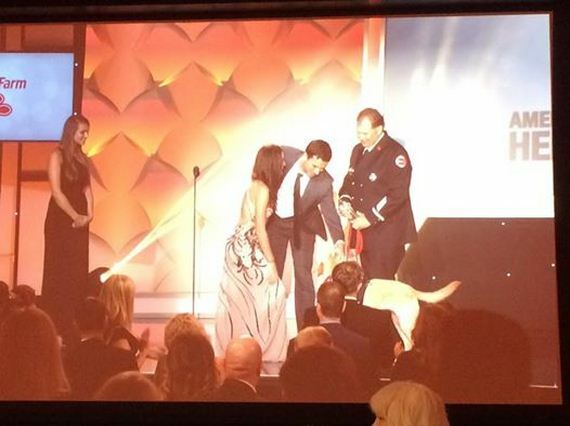 The winner is chosen through a combination of public votes and voting by a panel of animal advocates and celebrity judges including Victoria Stilwell, Jennifer Arnold, Prince Lorenzo Borghese, Philippe and Ashlan Gorse Cousteau, Alison Eastwood, Joanne Horowitz, Blake Koch, Bailee Madison, Adrienne Maloof, Agent Jerry Means, Laura Nativo, Shara Strand, Lisa Vanderpump, Kristin Bauer van Straten and Lou Wegner.